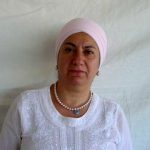 Dharam Kaur, a Brazilian of Armenian origin, had her first contact with Kundalini Yoga in 1996. She has since become an enthusiast, spreading the teachings, building group consciousness and inspiring teachers and students in São Paulo. She serves the Brazilian Kundalini Yoga Teachers Association, and is a KRI professional trainer. She organizes courses and White Tantric Yoga in São Paulo. Dharam founded the Cultural Association of Kundalini – a place to practice and study KY as taught by Yogi Bhajan.